This question comes up a lot: When, exactly, should you send your save the dates? That also expands to wedding invitations, thank you cards, and any other sort of stationery you might send after you get engaged. Don't question it anymore. I got you. I put together this great list that answers all your wedding postage questions (and the questions you didn't even know you have). Send your engagement party invitations out one month before your party, if you're having a large, formal party. If you're doing something more casual at home, give people at least a one week notice. Quick tip: For a casual party with immediate family only, you can get away with a phone call invite. Plus, they'll probably want to chat and hear your proposal story. Engagement party thank you cards? As soon as you get home from your party, write them. If anyone is generous enough to give you a gift at this (no one is required to at all -- it's sort of the only gift-free wedding related party), thank them immediately. Quick tip: My favorite engagement party gift idea is a box of thank you cards. The bride and groom will be able to start writing thank you's right away. 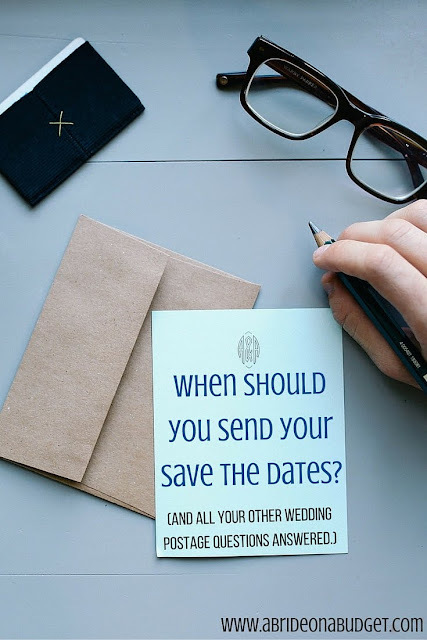 Sent your save the dates as soon as you set a date. Realistically, though, they should go out at least six months before your wedding date, if it's local and nine months to a year if you're having a destination wedding. Quick tip: If you're running out of time (or having a short engagement), you can always text your save the dates. You should sent your wedding invitations out so they arrive three months before your wedding date (meaning, you should mail them three weeks and one week before your wedding). Make sure you put the RSVP card in the invitation! Quick tip: Make the RSVP date five weeks before your wedding date (which means you'll receive them about one month before your wedding). "They" say you have up to a year after your wedding to send your thank you cards, but I don't know who this "they" is because that's ridiculous. Realistically, if you are including photos, those can take up to three months to get them back. So, if you are including wedding photos, you can send your thank you cards three months after your wedding. If you're not including photos, send them out within the first month. If you need help with these, check out our ultimate thank you card guide. Quick tip: If you're going on a honeymoon, purchase a bunch of postcards at the airport when you land. Spend one night writing thank you postcards and send them out before you head home. Whoever is throwing your party. That's generally your mom and maid of honor, if they choose to throw you one (they may not!). Quick tip: Give a copy of your guest list (with addressees!) to your mom after you send your save the date cards and go over it with her so she knows who to invite to your shower. Your maid of honor should take care of this, if she is throwing you one. Quick tip: Work with her and your bridesmaids to put together a guest list. Okay, this is sort of a trick question. Without knowing the size, shape, and weight of your invitations and thank you cards, it's impossible to estimate this. But, know this: square envelopes cost extra postage. Also, oversized and undersized envelopes cost extra postage. Square, oversized, and undersized envelopes all need to be hand sorted, so it costs more to send them. Heavier envelopes cost more to send than lighter ones, so keep that in mind when you're choosing the type of card stock to print on (a heavier card stock makes for a nicer invitation but more postage). Also, the more enclosure cards you add to your invitation, the more weight you're adding. Quick tip: Take one, completed invitation to the postage and have it weighed before you buy any stamps. Postage prices change often. Our friends actually bought post card stamps, affixed them to their RSVP cards ... and then post card stamps increased one cent. BRIDAL BABBLE: Do you have any other wedding postage questions?